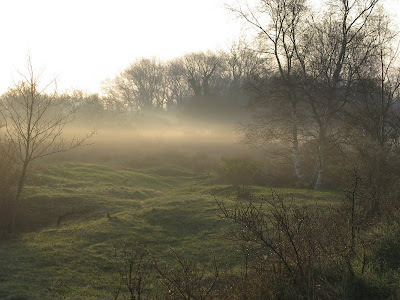 Today, I checked the usual places in Gent again. Many birds present (I could check about 110 LBBG's and 30 Herrings, and read 12 colour-rings (3 new ones). 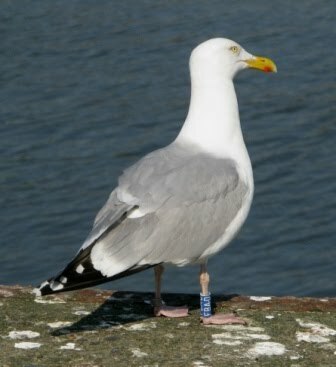 Best bird was a 4th cal Herring gull, which I saw once before in November 2007 (as a 1st cal bird), in Oostende. Great to see this one in Gent now! 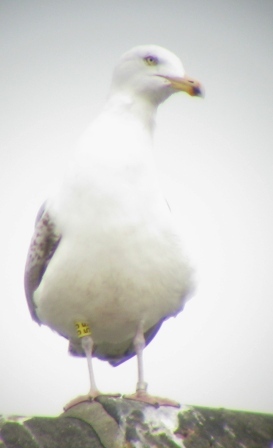 Herring gull yellow 55, first seen at the coast in 2007, now in Gent! 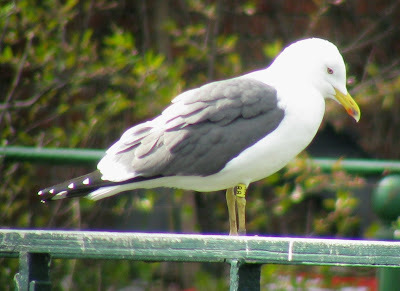 This is only the first colour-ringed Herring I see in Gent this spring. 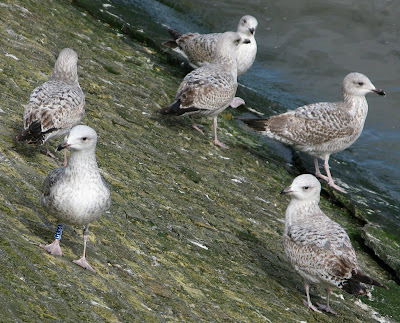 Blue C2 (project of RJ Buijs, but the blue ones are ringed in Zele, Belgium by F. Roels), last year I saw this bird at the same place on April 28th. 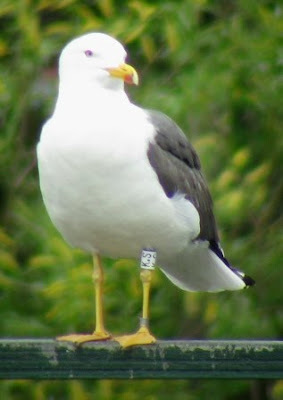 White K.S (RJ Buijs), first seen in July last year, my second observation of this bird. It was seen in Portugal last winter. Blue WK, another returning individual (first seen in March last year), which I already saw last week in the nature reserve "Bourgoyen-Ossemeersen" near Gent, now seen closer to the city. This bird was seen in Spain (Colmenar Viejo) in November. Yesterday was looking very promising for migration on the Belgian coast (winds from the southeast), so I headed there, and a nice day it turned out! More than 70 people enjoyed a great day, with the following highlights: 2nd cal Pallid harrier, 4 Caspian terns, Gull-billed tern, Osprey, Montagu’s harrier, Black kite, Merlins, 40+ Ring ouzels, Purple heron, … plus a nice supporting cast of thousands of swallows, even more Meadow pipits, and also, hundreds of LBBG’s. 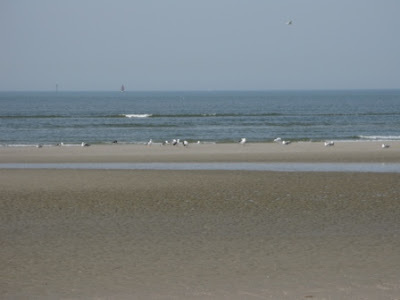 By midday migration slowed down, and I went to the beach to find some gulls, and – despite the many tourists – I was able to find some colour-rings. Highlights were two French-ringed LBBG’s (picture of one of them below), unfortunately one of the rings was too dirty to be read completely. 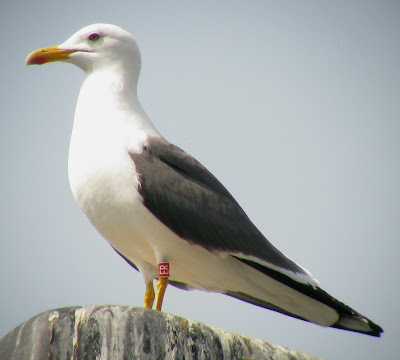 Other rings were all Herrings from the nearby breeding colony, including a 13 year old bird. After the beach I went to Oostende, and managed to read four more rings (all Herrings, two Belgian colour-rings and two metal rings). 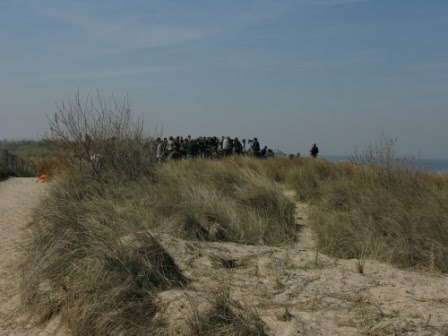 People watching spring migration on top of the dunes. A small flock of resting gulls on the beach of Zeebrugge. Red 248N (P.J. Dubois), a French-ringed bird (I'm waiting for details on this bird), my first bird from this project! The fish market of Oostende, especially in winter a good place to find ringed gulls, but there are always some birds around. Blue FBA.D (E. Stienen), this five-year old bird can be found very often near the fish market of Oostende, I first saw it there in 2007. 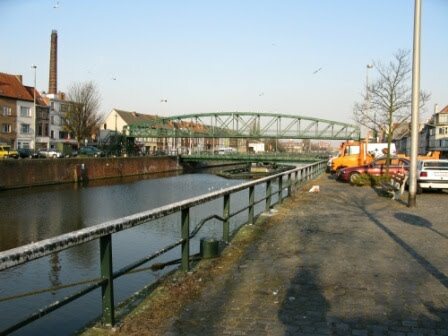 The past days I visited my patches in Gent twice, resulting in only a few rings (and no new ones). As an introduction, below are some pictures of how the places look like (they are not as nice as watching gulls on a beautiful beach, but it’s the closest place near my home). 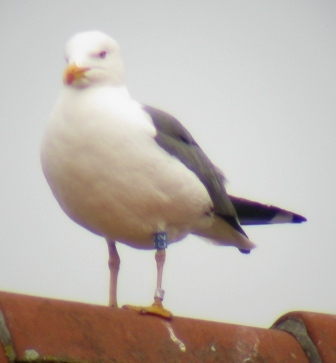 A few LBBG's are often present on the house to the left, and also on the street lights along this channel. 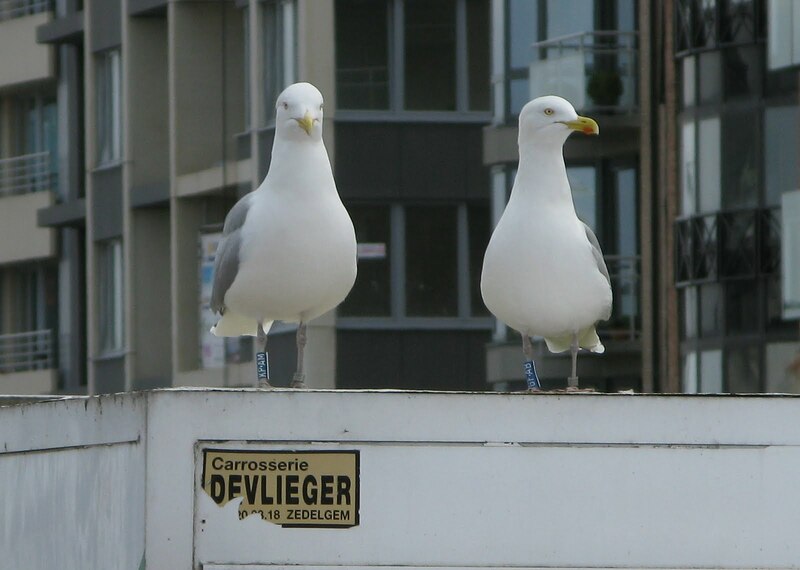 Two unringed LBBG's sitting along the "Nieuwevaart". 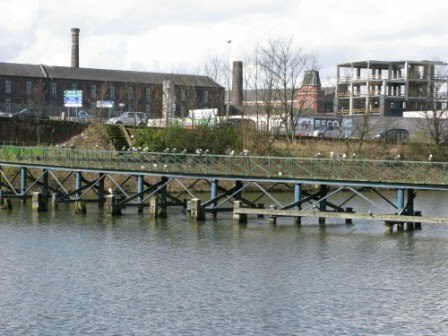 One of the best localities in Gent to read rings, the LBBG's are often resting here, sometimes 30-40 birds are present and can be seen very well. 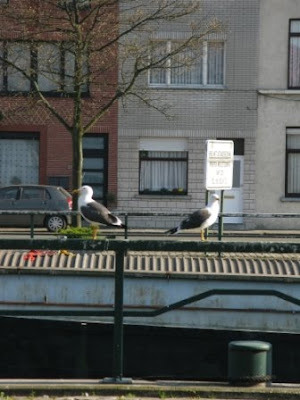 The best channel to watch for ringed gulls, they often sit on the street lights, or on the roofs of the houses. 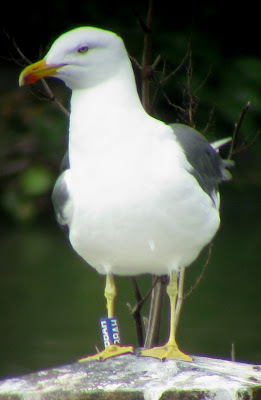 I visited the nature reserve of Nieuwpoort a few times recently, and saw mainly Belgian ringed Herrings, but also one British-ringed bird (unfortunately it was too far to take a decent picture), a French one (I saw two other French birds at Oostende, another hotspot for colour-ringed gulls), and a few Dutch birds (all from RJ Buijs, plus one metal-ringed bird). 2nd cal Herring gull blue MT.AS (Nieuwpoort), ringed as a chick in Oostende, Belgium (E. Stienen). This bird has been hanging around there all winter. Another picture of the same bird. 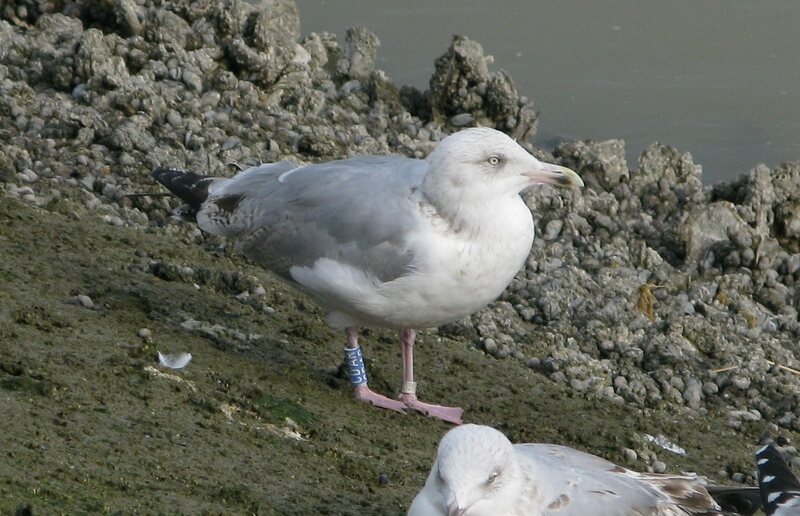 4th cal Herring gull blue CD.AR(Nieuwpoort), ringed as a chick in Oostende, where I saw this bird for the first time in 2007. 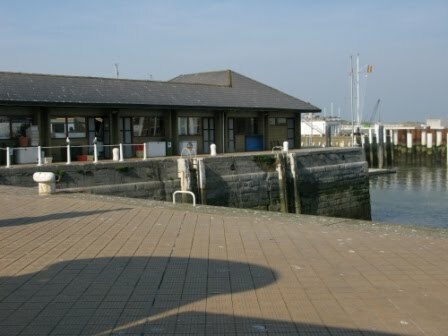 Since 2008 it has always been seen in Nieuwpoort. 2nd cal Herring gull 1R A (Nieuwpoort), ringed as a chick in northern France (JP Leys). Always nice to see a French one! 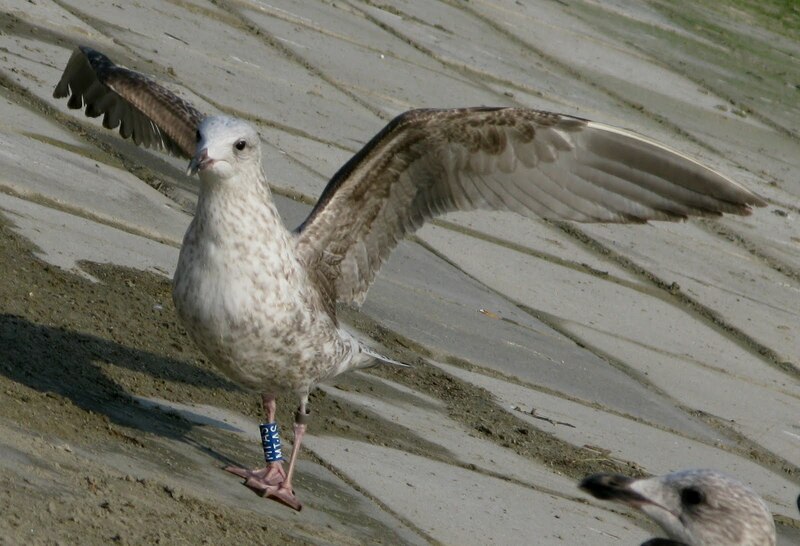 Adult Herring gulls blue KP.AM and GF.AB (Oostende), both ringed in Zeebrugge (E. Stienen), and in winter always present in Oostende. 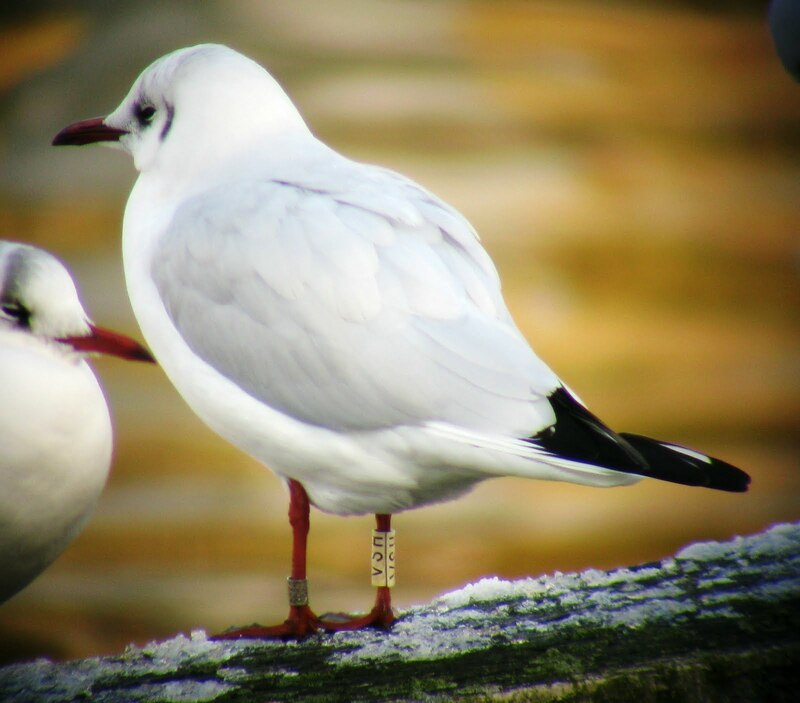 To end this post, Black-headed gull white VSH (Gent), ringed in Denmark (T K Pedersen). This winter, I saw two Danish-ringed birds in my hometown, the other one for its second winter in Gent! Like every year, Lesser black-backed gulls arrive back in Belgium after winter. In Gent, mainly birds from the colonies in Zeeland (Vlissingen) can be seen (at least, the ringed birds come from there). 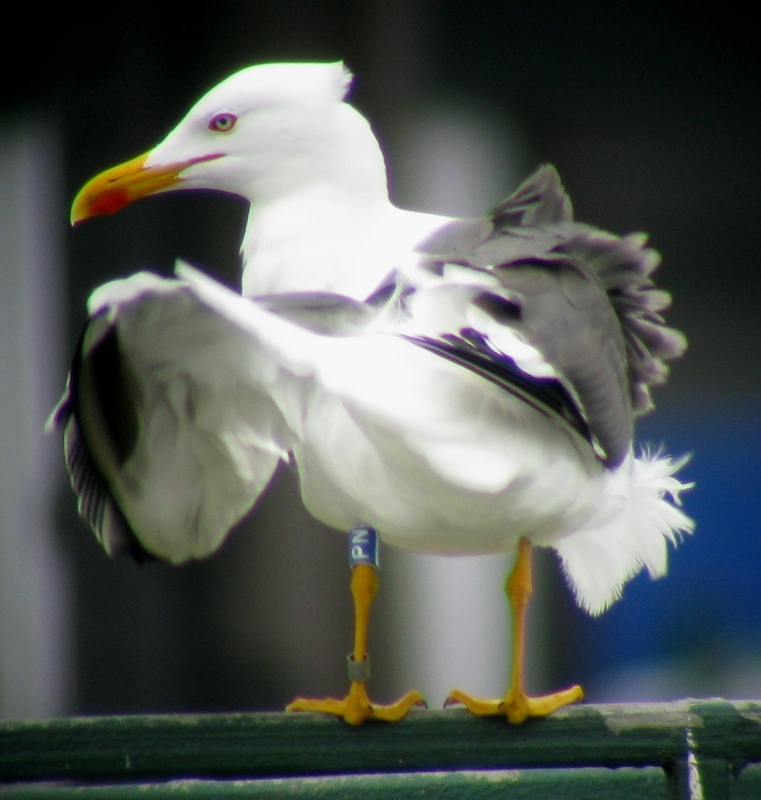 In spring 2009, I started to visit some places to record the arrival of these birds, and this resulted in 26 different c-ringed birds observed between the end of March and the end of May (some Herrings from these colonies were seen too). 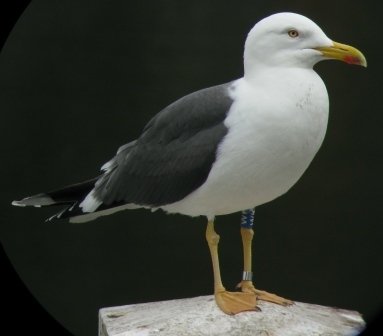 Only one of these birds was ringed in Zeebrugge, they seem to follow a more coastal migration route north. This year I started a little bit earlier, and so far I have seen 35 different birds. Some of these are birds seen last year too, but quite a few of them are new ones for me. The Belgian bird returned too, and another one was seen too (see picture below), plus a metal-ringed Belgian LBBG. Yellow 88, ringed as a chick in Vlissingen in 2006 (RJ Buijs), and observed in Gent on April 4th. 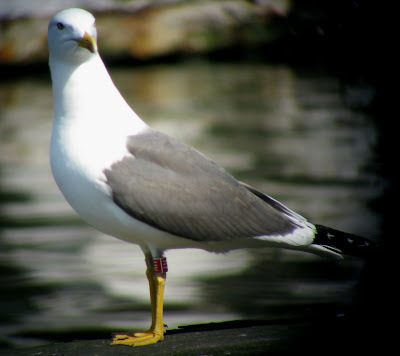 This bird was observed twice before, both times in Spain. 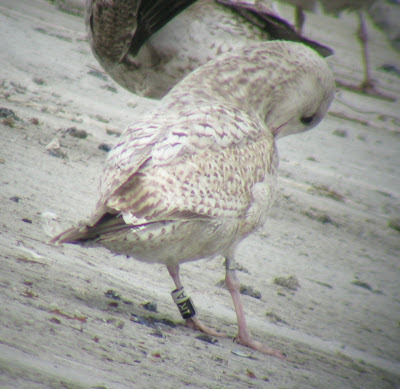 Red HY, ringed as an adult in Vlissingen in 2007 (RJ Buijs), and seen already several times this spring in Gent. Has already been observed in Portugel. 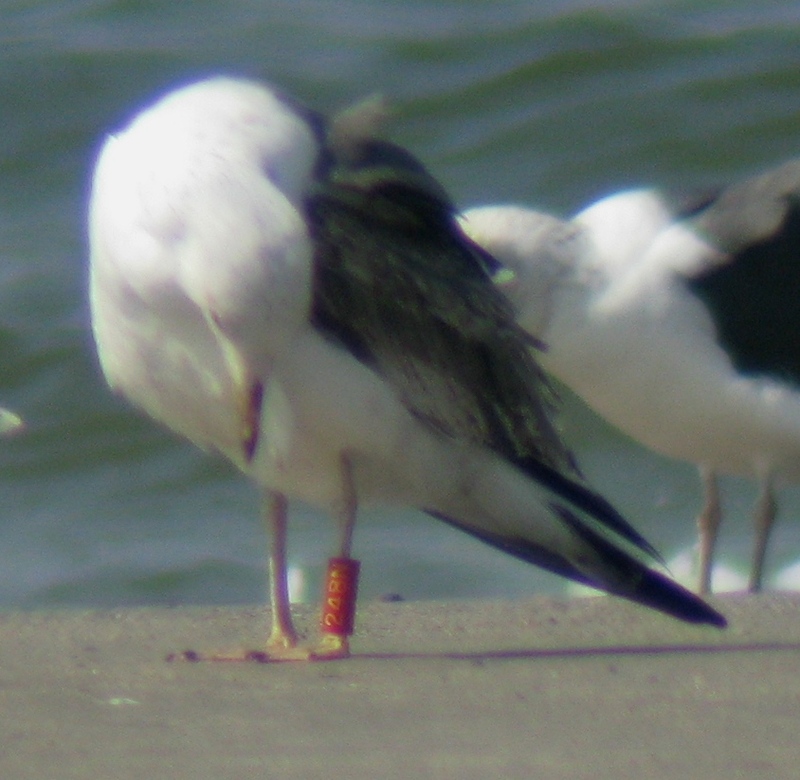 Red ER, ringed as an adult in Vlissingen (2007? ), and seen last weekend in Gent. No gull, but a picture I took during fieldwork in the dunes in early April, while Robins, Blackbirds, Chiffchaffs etc. were singing, so definately a spring picture! The main areas where I read rings are the Belgian coast (mainly Belgian-ringed Herrings), and Gent (mainly Dutch-ringed Lesser black-backeds). However, I sometimes visit other gull-watching places (like i.e. 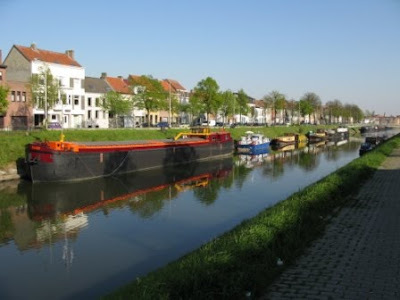 Le Portel). I'll post some birds from the last weeks soon, keep watching this space!